How a dangerous deal may hold some good for Israel. The writer, whose PhD. is from Hebrew U., is a social worker and teacher at the Hebrew Univ. School of Social Work, and Efrata College. Why is Prime Minister Netanyahu investing so much diplomatic and political capital in so aggressively opposing in Washington D.C. the Iran nuclear agreement, when he has little chance of winning, and will pay a significant, short term diplomatic price with the Obama administration? The answer is that our prime minister wants to clarify, in stark, black and white terms, to the world and to the Israeli public, the parameters of Israel's diplomatic/security needs in a threshold, nuclear empowered Iranian Mideast. He is bluntly teaching the world the messages that Israel's security needs-i.e. physical survival- sharply differ from those of the U.S. and Europe. For them, Iran is global nuisance, a neighborhood bully whom they hope to buy off with lucrative trade. For Israel, Iran is its most dangerous, arch enemy, who threatens our very survival. In this case what is good for the goose is definitely not good for the gander. For America and Europe a prosperous, threshold nuclear Iran may actually constitutes a light weight, stop gap, short term solution to Mid East instability. The Iranian economy provides cheaper oil and lucrative markets that can significantly bolster Europe' faltering economies. Furthermore, America's existence is in no way threatened by Iranian missiles, or Hezbollah's armory. More significantly, over fourteen thousand Americans have died in the Iraq and Afghanistan wars, and America has zero - absolutely zero - diplomatic benefits to justify such a considerable loss of life. American 'boots on the ground' in the Mid East have been shown to be an ineffective answer to Islamic terror. To America and Europe, it makes no difference which Sunni or Shiite factions rule Libya, Syria or Yemen. Just as America basically ignores, and certainly does not send troops to Africa to resolve tribal-national conflicts, the same rule of thumb is basically applicable to Mid Eastern sectarian-national conflicts. The Iranian nuclear accord is a diplomatic smoke screen being used to cover a conscious diplomatic effort to reduce American involvement in the 'crazy', unsolvable Shiite-Sunni Mid East conflict. America has no need or profit to serve as a 'policemen' on the Sunni-Shiite Street. A nuclear accord that inevitably strengthens and actualizes the Iranian-Hezbollah terror threat has the 'silver lining' of reframing the Palestinian question. Shiites and Sunnis still want to destroy each other after 1,300 years, we must take very seriously Iran's daily, loudly proclaimed intentions to destroy Israel. Iran is not Denmark, and the Mideast is not the European Union. Today, Iran and its proxy, the Hezbollah, and sometimes the Hamas, constitute the primary threats to Israel's security and existence, replacing the enmity of the Sunni Egyptian, Jordanian and Syrian coalition that has existed since 1948. However, there seem to be two 'silver linings' in Iran's de facto nuclear cloud. First, Israel's previous Sunni enemies now find themselves with Israel on the same side of the battlefield opposite Iran's raging Shiite tide. Thus, we see the gradual development of military and security coordination between Israel, Egypt and Jordan in order to better cope with the Islamic terror threat. Hopefully, America will understand and diplomatically and financially support these efforts. 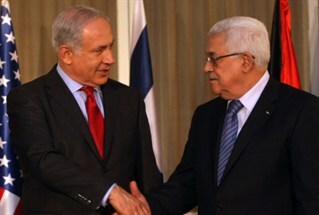 Second, an additional 'silver lining' regards the Israeli-Palestinian dispute. By emphasizing the preeminence of the Iranian-Hezbollah terror threat, Bibi is implicitly explaining to the world that in a post nuclear agreement Mideast, the Palestinian-Israeli conflict is a secondary sideshow with regard to its its global danger. In the short term, Bibi's efforts will not succeed on the European diplomatic front, partially because of homegrown Muslim electoral pressure. However, if there is a war between Israel and Hezbollah-Iran, one which may very well cost Israel several thousand civilian casualties, and cost Lebanon many more deaths, all but the most anti-Semitic European diplomats might finally understand who truly constitutes a threat to Israel's existence, and Mideast stability. i.e. Iran-Hezbollah and not the Palestinian Arab question. After a possible Israel-Iranian-Hezbollah war, all but the most anti-Semitic European diplomats will understand that while it may be realistic to demand Israel to curb most settlement activity, and grant the Palestinian Authority increased diplomatic sovereignty in non-military areas, it can in no way be asked to cede military control over Judea and Samaria, and thus spread out a red carpet for ISIS and Iranian-Islamic terror proxies to literally arrive at the doorsteps of 60-70% of Israel's population. And if that is enough to convince European diplomats of Israel's all too real need to retain full military control over Judea and |Samaria, Bibi's geopolitical analysis will certainly convince the Israeli public. The coming war will consolidate an already existing consensus of 80% of the Israeli public that the last thing Israel needs is to militarily withdraw from Judea and Samaria and thus literally commit suicide. Based on Europe's and Obama's diplomatic priorities and behavior (as explained above) no sane Israel would grant NATO, America, or the Palestinian Authority military responsibility for fighting Islamic terror on the 'West Bank', Israel's back yard. The P.A is too weak. Europe is subject to growing Muslim-anti Israel electoral pressure at home. And Obama does not want to again put American troops back on Mideastern ground. Thus, a nuclear accord that inevitably strengthens and actualizes the Iranian-Hezbollah terror threat has the 'silver lining' of reframing the Palestinian question. The life of the Palestinians can be improved by intensifying economic development, and possible increasing self determination in non-military areas. However, in no way can they be granted the type of political independence that would require an Israeli military withdrawal from Judea and Samaria. Asking Israel to commit suicide is a diplomatic non-starter. The above is the implicit, but actual and real, message of Bibi's campaign against the Iranian nuclear agreement, one that emphasizes Iran's increasing terror presence in the Mideast. One 'silver lining' is the growing military and intelligence cooperation between Israel and its former Sunni enemies, Egypt and Jordan. The second 'silver lining' is the inevitable realization that a two state Palestinian agreement that would require Israeli military withdrawal from Judea and Samaria is completely unrealistic. It is a not so subtle invitation for Israel to commit suicide and in no way sellable to 80-90% of the Jewish Israeli electorate. Obama did not intend this. The inevitable geopolitical consequence of empowering a threshold, nuclear Iran is that a true, implementable 'two-state' Israeli-Palestinian agreement died in Vienna. For the time being, may it rest in diplomatic 'peace'.